Architecture diagram of network storage types. iSCSI login flow with CHAP authentication. iSCSI (Internet Small Computer System Interface) provides SCSI access over IP networks. iSCSI is an Internet Protocol (IP)-based storage networking standard for linking data storage facilities. By carrying SCSI commands over IP networks, iSCSI is used to facilitate data transfers over intranets and to manage storage over long distances. iSCSI can be used to transmit data over local area networks (LANs), wide area networks (WANs), or the Internet, and can enable location-independent data storage and retrieval. iSCSI allows clients (called Initiators) to send SCSI commands (CDBs) to SCSI storage devices (LinuxIOs) on remote servers. It is a popular SAN protocol, allowing organizations to consolidate storage into data center storage arrays while providing hosts (such as database and web servers) with the illusion of locally-attached disks. Unlike traditional Fibre Channel, which requires special-purpose cabling, iSCSI can be run over long distances using existing network infrastructure. The LIO iSCSI fabric module (iscsi.ko, Linux kernel driver database) was released with Linux kernel 3.1 on October 24, 2011 (2011-10-24). 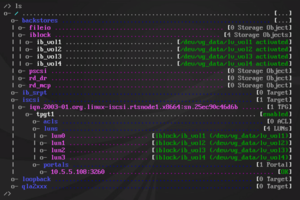 targetcli from Datera, Inc. is used to configure LIO. targetcli aggregates LIO service modules via a core library, and exports them through an API, to provide a unified single-node LIO SAN configuration shell, independently of the underlying fabric(s). targetcli is invoked by running targetcli as root from the command prompt of the underlying OS shell. targetcli automatically creates the Target Portal Group (TPG) and per default assigns a sequentially increasing TPG tag, starting from '1', thereby creating a TPG1. targetcli per default automatically assigns sequentially increasing LUN IDs, starting from '0', thereby exporting /dev/sdb as LUN 0 in the example above. Taking you back to /iscsi/iqn.2003-01.org.linux-iscsi.san01.x8664:sn.05135a0e4a11/tpgt1. Successfully created network portal 192.168.1.139:3260. For iSCSI Network Portals, targetcli automatically uses the iSCSI default port number of '3260', thereby forming a valid new iSCSI Endpoint. The iSCSI Endpoint makes the TPG discoverable by iSCSI initiators. Configure the access rights to allow logins from initiators. The three basic setups for LUN authentication are discussed below. Parameter demo_mode_write_protect is now '0'. 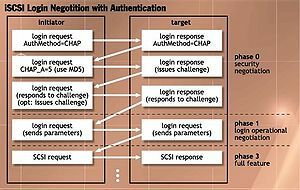 Parameter authentication is now '0'. Parameter generate_node_acls is now '1'. Parameter cache_dynamic_acls is now '1'. This exports the IBLOCK backstore as LUN0 to initiators without any access restrictions. Demo mode puts your data at risk! Demo mode exports "open" LUNs with no authentication requirements. This creates significant security and data integrity hazards. Do not do this for production setups, unless you are certain of what you are doing. You have established physical security through a closed, controlled SAN environment. You are using your SAN in conjunction with a clustered filesystem that guarantees coherence across multiple initiators, typically via distributed locking. You have carefully analyzed your ACL setup with regard to its security and data integrity requirements and risks. This creates an iSCSI Node ACL with a mapped LUN0. Node ACLs allow mappings of actual LUN IDs onto arbitrary Mapped_LUN IDs, which are the LUN IDs presented to initiators. These mappings can match preferred LUN IDs for particular initiators, so for instance, a LUN1 can be mapped onto Mapped_LUN0 to make LUN1 appear as iSCSI LUN0 on the initiator. Usually, LUNs are identically mapped, however. Parameter userid is now 'iqn.1991-05.com.microsoft:ibm-t410s'. Parameter password is now 'mytargetsecret'. The iSCSI Endpoint is now ready for secure logins from the specified iSCSI initiator. The Windows iSCSI Initiator uses its IQN as a default login name. For CHAP Initiator Authentication, it requires the password length to be at least 12 bytes (96 bits), and it rejects passwords that are too simple. The Windows iSCSI Initiator allows changing the default login name through the Targets tab → Connect button → Connect To Target dialog → Advanced… button → Advanced Settings dialog → Enable CHAP log on checkbox. The userid (login name) and password (target secret) for the target. The userid_mutual (login name) and password_mutual (initiator secret) for the initiator. Parameter userid_mutual is now 'iqn.2003-01.org.linux-iscsi.san01.x8664:sn.05135a0e4a11'. Parameter password is now 'mymutualsecret'. The Windows iSCSI Initiator uses its IQN as the default login name. For Mutual CHAP Authentication, it requires the password length to be between 12 bytes (96 bits) and 16 bytes (128 bits), and it rejects passwords that are too simple. The Windows iSCSI Initiator allows changing the default login name through the Targets tab → Connect button → Connect To Target dialog → Advanced… button → Advanced Settings dialog → Enable CHAP log on checkbox. Setting up authentication information for every single initiator separately can be cumbersome, so targetcli provides the capability to define common login information for all Endpoints in a TPG. As a result, all initiators connecting to that TPG can use the same login credentials. Parameter userid is now 'rts-user'. Parameter password is now 'b492785e-bc91-4710'. Parameter userid_mutual is now 'mutual-rts-user'. Parameter password_mutual is now 'aeae2e26-f043-42a7'. Login credentials for specific initiators can be created by adding corresponding ACL entries, as individual ACL entries override common TPG Authentication information. Optionally, the iSCSI protocol can also control the visibility of iSCSI targets for discovery by iSCSI initiators. Parameter enable is now '1'. Parameter userid is now 'mytargetuid'. Only iSCSI initiators that can authenticate themselves with a user id of "mytargetuid" and a password of "mytargetsecret" can now discover this iSCSI target. The mutual_userid (login name) and mutual_password (initiator secret) for initiators. Parameter mutual_password is now 'mymutualsecret'. Parameter mutual_userid is now 'mymutualuid'. Only iSCSI initiators that can authenticate themselves with a user id of "mytargetuid" and a password of "mytargetsecret" can now discover this iSCSI target, and conversely, the iSCSI target can only discover iSCSI initiators that can authenticate themselves with a user id of "mymutualuid" and a password of "mymutualsecret". RTS spec files define the fabric-dependent feature set, capabilities and available target ports of the specific underlying fabric. In particular, the iSCSI spec file /var/target/fabric/iscsi.spec is included via RTSlib. # The iSCSI fabric module uses the default feature set. ↑ Linus Torvalds (2011-10-24). "Linux 3.1". lkml.org.